Parallel to the resulting intellectual emptiness of political repression occurred in the 1960s, 1970s and 1980s a process of fragmentation of the academic units, new faculties were created and new institutes, which resulted in new courses, new lines of research and graduate programs. Originally conceived as the academic core of the university - gathering itself the various fields of knowledge - the FFCL (School of Philosophy, Sciences and Letters) saw its departments gain autonomy and become full units (autonomous and administratively separate from your original aim). The Institute of Physics was the first department to extricate itself from the old FFCL, followed also by other departments of natural sciences. SIR World Report 2013 from SCImago Institutions Rankings classified the university in the 12th place in the world (11th in 2012). In 2012, according to the University Ranking by Academic Performance (URAP), the University of São Paulo is the best university in Ibero-America and 28th university in the world. According to ARWU, USP was classified in the first place, regarding the number of doctorates awarded during 2011. Mines ParisTech ranked USP in 42nd place. Ranking Web of Universities 2013 classified USP in the 31st place. USP is ranked among the top 70 universities in the world, in the Ranking "Top Universities by Reputation 2013" published by Times Higher Education. NTU Ranking classified the university in the 53rd place. According to the 2013 Academic Ranking of World Universities, USP is placed in the group of the 101–151 top world universities. According to the 2013 CWTS Leiden Ranking the University of São Paulo is placed in the position 12th at the world. In the 2013 QS World University Rankings University of São Paulo ranked 127th (academic reputation 51st) and is the best classified in the specific ranking of Latin America's universities. In 2012, the University of São Paulo is the first Ibero-American institution in the Times Higher Education World University Rankings's top-200 (Position 158 in the World). 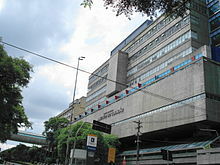 USP operates 4 hospitals, among them University of São Paulo Medical School Public Hospital, the largest hospital complex in Latin America and the major teaching and training site for the university's School of Medicine - it is considered one of the best health care institutions in Latin America. The University of São Paulo has 42 libraries spread over its schools. Together they represent one of the most important bibliographical collections in Brazil. 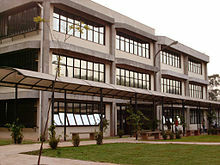 The libraries are managed by the Integrated Library System (SIB - Sistema Integrado de Bibliotecas in Portuguese), which is also responsible for university's online system - DEDALUS. Panorama of the Uniservity City in São Paulo. ^ "Ranking Universitário Folha - Rankings - Ranking de Universidades". ruf.folha.uol.com.br. Retrieved 2016-04-26. ^ "Brazil's Multi-Billion Dollar Education Industry: Shaping Futures, Changing Lives, and Minting Billionaires". Forbes.com. 2013-05-13. Retrieved 2016-04-28. ^ Schwartzman, Simon (2010-06-24). "The new ranking of Ibero-American universities | The World View". Insidehighered.com. Retrieved 2016-04-28. ^ "World Reputation Rankings". Times Higher Education (THE). 2015-06-04. Retrieved 2016-04-26. ^ "QS World University Rankings 2013". Top Universities. 2013-08-27. Retrieved 2016-04-26. ^ "PROFESSIONAL RANKING OF WORLD UNIVERSITIES : Enquette 2011" (PDF). Mines-paristech.fr. Retrieved 2016-04-28. ^ "Instituições públicas concentram as pesquisas científicas". ANPEI. 2014-06-20. Retrieved 2016-04-28. ^ "Conheça a história da criação da USP". redeglobo.globo.com (in Portuguese). Retrieved 2017-06-24. ^ a b c "História | USP - Universidade de São Paulo". 5.usp.br. 2014-06-20. Retrieved 2016-04-28. ^ "URAP - University Ranking by Academic Performance". Urapcenter.org. Retrieved 15 August 2013. ^ "Highly-ranked French engineering school - MINES PARISTECH". Mines-paristech.eu. Retrieved 5 July 2015. ^ "Ranking Web of Universities – World". Retrieved 8 February 2013. ^ "No data records!". Nturanking.lis.ntu.edu.tw. Archived from the original on 21 September 2013. Retrieved 5 July 2015. ^ "CWTS Leiden Ranking 2015 - Ranking 2015". Leidenranking.com. Retrieved 2016-04-28.